What's black and white and not an Asian longhorn beetle? At least 10 species of beetle are easily mistaken for the hated Asian longhorn beetle. 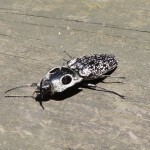 Keep reading What’s black and white and not an Asian longhorn beetle?